The following article and accompanying photos are taken from the January 1979 issue of International Cycle Sport and are reprinted without permission. The magazine itself folded many years ago. If anyone knows the copyright holder and they have an objection I will, of course, remove this page. SCANDAL! was the cry that went up at the finish of the Amstel Gold Race, and the loudest voice was that of Flandria manager Fred de Bruyne. He, and those who howled the word with him, had good right. Scandal is a word that is often used to signify a false result. This time this word was used by every Continental reporter no matter the media. A blatant act of sporting vandalism, maybe the worst to be perpetrated in modern times, made the result of the Amstel into a mockery, and it this classi- fication is allowed to stand in the record books then that, too, is an admission of weakness in the world of race commissaires in the Netherlands. 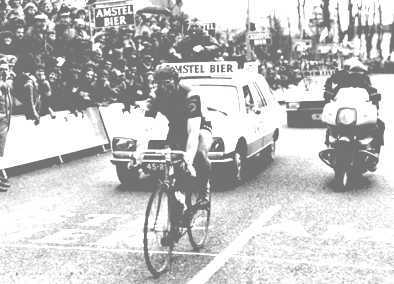 The start of the final episode of the race came as no surprise, for Hennie Kuiper had prepared the ground admirably for Jan Raas' scalding attack up the Cauberg out of Valkenburg with 15 kilometres leh to cover. But no sooner had the Raleigh man gone clear, than he found himself behind a solid, fast-moving phalanx of predominantly Dutch motorcycles. This incredible wall of shelter inspired Raas to even greater efforts, which soon saw him clear of Francesco Moser, Joop Zoetemelk, Freddy Maertens, and Kuiper. Bartolozzi, at the wheel of the Sanson team car, seeing what was happening, flung his own vehicle into the fray signalling Moser to tuck in behind. Peter Post, piloting the Raleigh car, saw him coming up and tried to block the road. The confusion was colossal, the two cars boring and shoving at each other whilst the riders desperately tried to pass. By the time a modicum of reason reigned betwen the Raleigh and Sanson team directors it was too late for Moser to react, and in any case he had only a tired Zoetemelk, a weakened Maertens, and a non-working Kuiper to turn to for support. This frightful situation spoiled an otherwise perfectly organised Amstel, which was also a very good bike-race, as you can see by who was up at the front by the time the event entered Valkenburg for the final charge. In the knowledge that the second part of the race would be terribly severe, the first 100 kilometres were taken at a steady pace, not that this was at all slow as many dropped men would willingly testify, and this section was marked only by a fall from Maertens who got back into the fold without a great deal of trouble. Roger de Vlaeminck, fresh from his great triumph in Milan-San Remo, took over his 'ordinary' job as lieutenant to Moser, and led the field up the first ascent of the ghastly Keuteberg, (km 70) followed by Raas and Didi Thurau, and then Moser, Gregor Braun, Andre Dierickx and Michel Laurent. Despite a general regrouping after the climb, it was obvious that the Ijsboerkes were out to control the race, counting on a victory either from Walter Godefroot or Thurau. The World Champion once again attacked ferociously at the 1 60-kilometre mark, with 70 to go, this offensive splitting the field into two distinct groups. Knetemann, taken by surprise, found himself in the second one but never gave up for a moment, being in the useful company of young Leo van Vliet (keep an eye on this one for future reference!) Ronald de Witte and Jan Krekels amongst others, and came up to the leaders again after a hard 10-kilometre chase. So, as they approached the packed slopes of the Keuteberg for the second time (km 190), the head of the race was composed of 6 Ijsboerke, 5 Raleigh, 4 Peugeots, 2 Sansons, and one sole Flandria, Maertens . . . and the Belgian star wasn't happy about it one little bit. Knetemann attacked and got clear with Van Vliet, Bourreau, and Godefroot, and stayed away until they'd topped the Keuteberg where Moser organised the chase and Godefroot punctured. Moser attacked again after he had made the junction, and once again Van Vliet and Bourreau managed to hold him, but with great difficulty as the great Italian was carrying out his plan to the letter, that being to get rid of all the roadmen- sprinters on the endless climbs. At this point Braun, Knetemann, and Thurau just had to let him go. And so it came down to the last actors in this epic that unfortunately would be turned into a farce. Moser, Maertens Zoetemelk, Raas, and Kuiper were away and ready for the curtain to go up for the last act of the tragedy that was to be the Grand Finale of the Amstel Gold Race. 3 J. Zoetemelk (Mercier) s.t. 4 F. Maertens (Flandria) s.t. 5 H. Kuiper (Raleigh) s.t. 7 G. Braun (Peugeot) s.t. 8 L. Van Vliet (Mercier) s.t.